Fans are going gaga over Kangana Ranaut's powerful performance in Manikarnika: The Queen of Jhansi. “Khoob ladi mardani woh toh Jhansi wali Rani thi.” Kangana Ranaut makes sure to make us feel and absorb these words in under a two-and-a-half hour story of Manikarnika: The Queen of Jhansi. Born in Bithoor, Manikarnika was always known for her strength and valor. Kangana sets the pace right in the first 5 minutes with a fiery scene where she is seen hunting down a TIGER. The scene establishes both her human and warrior side as Manu, fondly addressed by her acquaintances, nurses the Tiger after neutralizing him with a bow and arrow. That scene is beautifully shot and executed and what follows next is a tiresome first half. The first half captures Manikarnika’s journey from being a solicit book lover, warrior to that of a Rani Laxmibai. While most of the first half is stretched, there are a few scenes which stand out. Kangana outdoes herself in emotional scenes. The scene where she grieves the death of her son, Damodar Rao, has been executed extraordinarily while the scene where she holds the reign of the kingdom as the widowed Queen will give you goosebumps. Kangana embodies Rani Laxmibai’s trait like a second skin and there is qualm about it but wish that was enough. The second half mostly captures and celebrates the valour of Jhansi Ki Rani who is married to her land, in her own words. However, it seems too much time was spent reshooting the movie as the screenplay by KV Vijayendra Prasad at several points look abrupt. Good parts first, the action sequences in the second half are choreographed really well even though it looks OTT at some levels. But then again, we have all collectively hooted at the larger than life action sequences of our male superstars, haven’t we? Kangana makes the action sequences and overdramatic emotional scenes believable. Coming to the direction, Kangana seems to have tried too hard to salvage the direction after Krish left the movie midway. But she seems to have done a fair job in most parts. For me, the background score by Sanchit Balhara and Ankit Balhara elevated the dull parts in the first half while it added to the irritation in the second. However, the dynamic trio Shankar Ehsaan Loy’s music did not offer much to the plot. Ankita Lokhande makes an impressive debut as Jhalkari Bai. With minimum screen time, the actress exudes nothing but confidence and it’s one of the major highlights of the movie. Apart from Mohammad Zeeshan Ayubb who replaced Sonu Sood as Sadashiv Rao, the supporting cast has been the biggest letdown. Richard Keep played General Huge Rose who was decent though his role could have been more defined. Kangana’s fiery act and Ankita’s confidence deserved a better ensemble surely. While the direction and cinematography tried to salvage, shoddy VFX were too apparent to ignore. For instance, a scene where General Huge is seen hallucinating about Goddess Kaali will make you laugh out loud. Not just that, Prasoon Joshi’s over dramatic dialogues made us laugh even in tense situations. It seemed like an Ekta Kapoor daily soap script, honestly! It seemed Prasoon was writing those dialogues for Kangana and not Laxmibai. Vijayendra has taken different chapters from Manikarnika’s life but loses the plot midway. The confusion of what he intends to show is apparent onscreen but Kangana makes up for the poor first half with a ‘’mardani’ act in the second. If you are wondering about giving a shot to the movie, we say go strictly to see the Queen perform. 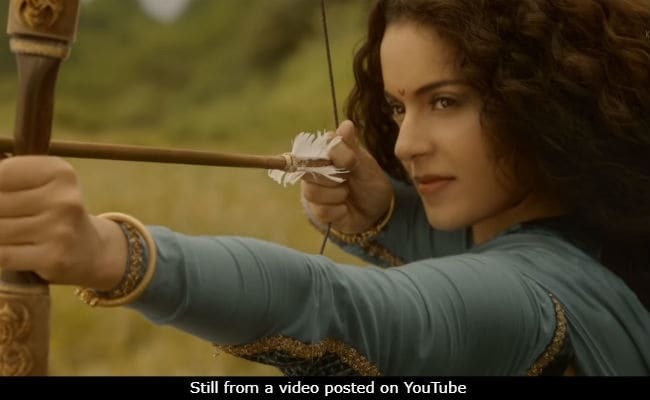 Meanwhile, fans have been going gaga over Kangana’s performance as Rani Laxmibai and can’t stop praising the actress. However, there were some who were not too happy about the storyline and direction of Manikarnika. Unfortunately hamare desh k kuch log, kuch Media Modi aur BJP se nafrat karte karte Bharat desh se nafrat karne lage hai, Army se nafrat karne lage hai. Inhe #Uri aur #Manikarnika jaisi behetereen films BJP k liye propaganda lagne lagi hai, desh bhakti propaganda lagne lagi hai. #Manikarnika is phenomenal. If I've to ignore to the VFX, then I'll give it 5. Kangana has done a really fabulous work. Her aggression, her wrathful eyes, her caring for the people…everything is outstanding. "Main Rahun Ya Na Rahun Bharat Ye Rehna Chahiye"
Overall, Manikarnika has many moments of genius and enough fire to keep you glued to the screen. Kangana’s performance as Rani of Jhansi is worth every penny spent. So, if you are looking to feel patriotic this Republic Day and watch a visually stunning bit of cinema, go for this one with friends and family and you’ll have a great time at the theatres.